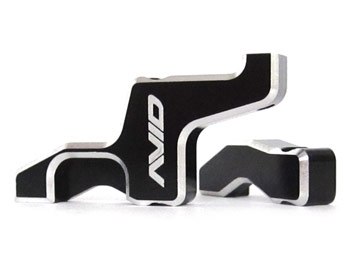 AVID B4 aluminum steering bellcranks are machined from billet 6061-T6 aluminum alloy, black anodized, and laser etched for a premium look. Each package includes 1 left and 1 right bellcrank which replace the plastic servo saver and bellcrank on any B4, B4.1, T4, T4.1, and SC10. 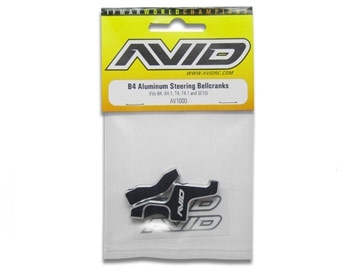 The AVID B4 aluminum steering bellcranks are a must-have upgrade for any serious racer. These aluminum bellcranks eliminate flex in the steering system for maximum steering feel. 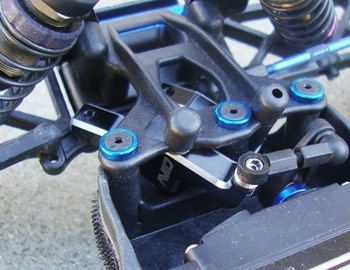 They also eliminate the plastic servo saver which can fail and cause DNFs. 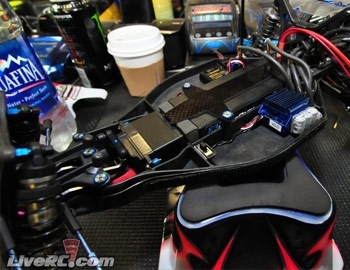 According to the Xtreme RC Cars, the single biggest improvement in lap times to a short course RTR was to lock the servo saver. Flex in the steering system is one of your biggest enemies, especially in heavier short course trucks which have larger, heavier tires. Associated ace Ryan Maifield installed the AVID bellcranks on his B4 and went on to take the win at the Winter Midwest Championships in Columbus, Ohio. These parts eliminate the servo saver and should only be used in conjunction with a high quality metal gear steering servo. In all of our R&D testing we have not had a servo failure but just as a standard small print, AVID is not responsible for possible servo failures while using this performance enhancing product. Assemble the steering rack screws with blue thread lock. Also, if you tighten down the 2 BH screws to hold the steering rack and you feel a bind in the movement, it could be that the steel pivot bushings are too short. Slide a thin motor shim over the screw before installation and this will prevent the screw from clamping onto the rack and causing drag.